Winter: 8:00 a.m. to 12:00 p.m. - 4:00 p.m. to 6.30 p.m.
Summer: 8:00 a.m. to 12:00 p.m. - 5:00 p.m. to 7.30 p.m.
Sunday: 08:00 a.m. - 01:30 p.m. It was built in fourteenth century by Catalans, in the area were existed the Pisan tower named Lapola (ancient name of the Marina district) and the medieval Church of S. Maria del Porto. Revised in 1700, it still retains architectural Gothic elements, the sidelong chapels and baroque furnishings. It is one of the most ancient church in the district of Marina, built in Gothic-Catalan style, and dedicated to the Santa of Barcellona by the Catalans, who had just conquered the city. The church was alterated different times until the costuction of the present facade, dating back to the 20th century; it presents in the interior a unique nave with a starry vault. In 1990,during the restauration of the vestry, it was discovered a well, with a depth of 16 metres and full of rubbles. After this discovery, there were other excavations, which brought to light a part of the ancient city, including a paved road of the Roman Era which was superimposed on an other street of Medieval times. They were brought to light also the remains of a temple, a collonade and different environments of the Roman Era, that later were adapted to Mediaval period. 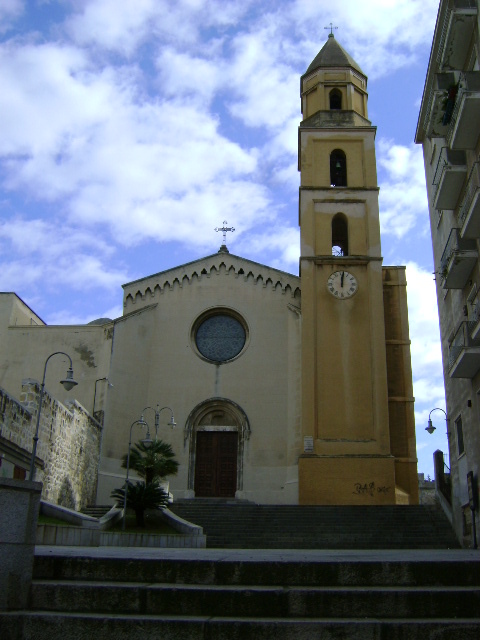 Near to the church, there is the archeological site named “Museum of Sant'Eulalia's treasure”, where are preserved vestments and sacred works of Sardinian artisans from 16th to 19th century.